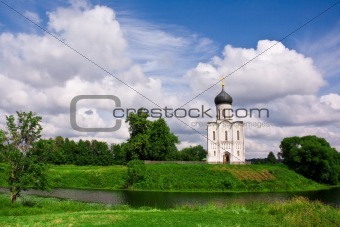 Image Description: The Church of the Intercession of the Holy Virgin upon Nerl River (Russian: Ð¦ÐµÑÐºÐ¾Ð²Ñ ÐÐ¾ÐºÑÐ¾Ð²Ð° Ð½Ð° ÐÐµÑÐ»Ð¸, Tserkov Pokrova na Nerli) is one of the loveliest Orthodox churches and a lyrical symbol of mediaeval Russia. In spring, the area would be flooded, and the church appeared as if floating on water. It is situated at the confluence of Nerl and Klyazma Rivers in Bogolyubovo, 13 km north-east of the ancient capital of Vladimir.